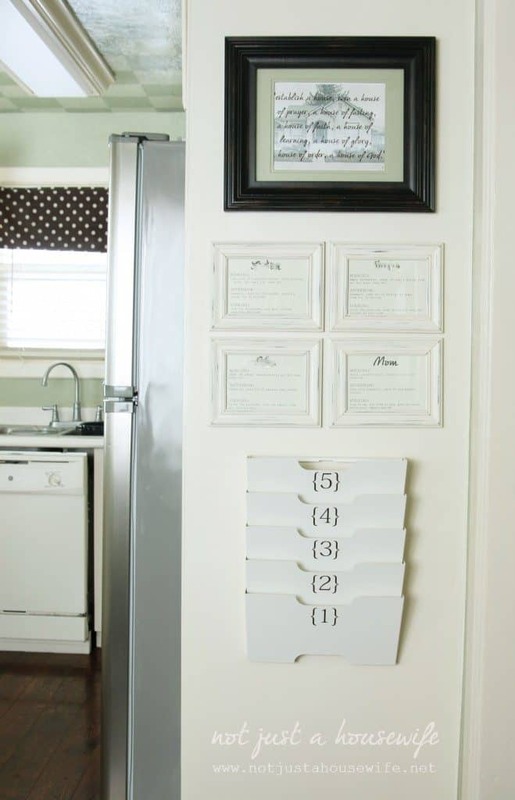 Command Centers are becoming increasingly popular these days and they are such a good way to keep your family organized! Creating a family command center is a great way to keep all of the important information your family needs to know in one place. 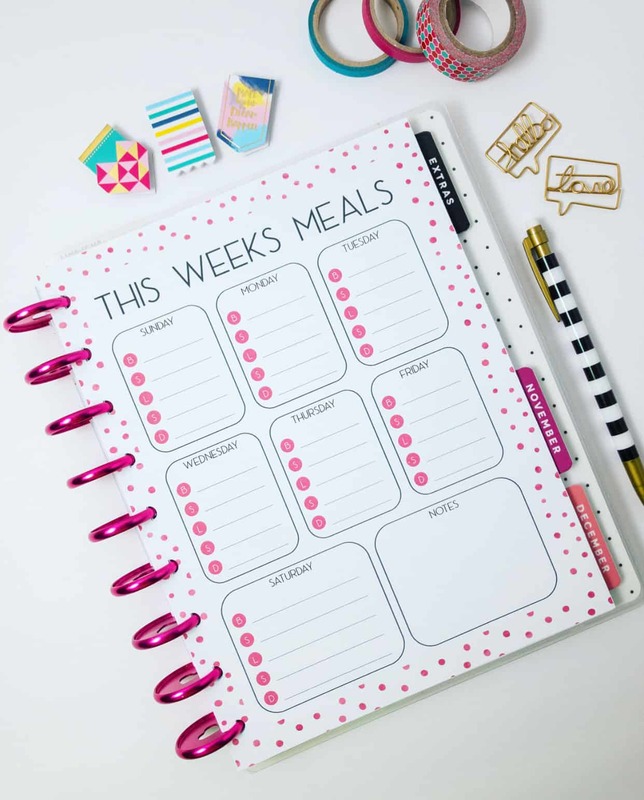 With a command center you can display your meal plan, schedule, hang up backpacks and keep track of homework, and so much more! 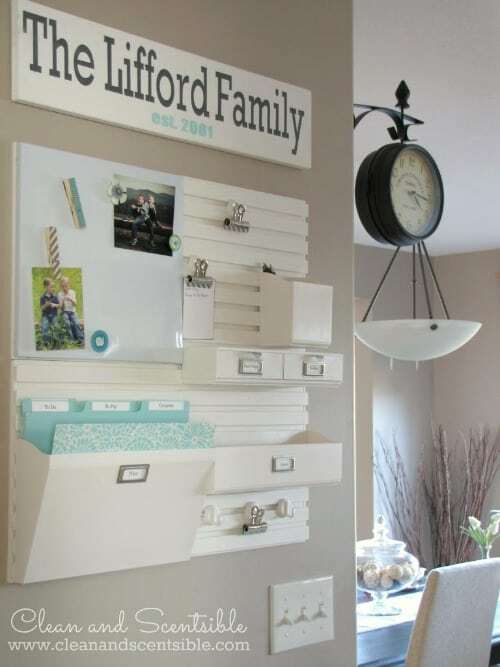 To help you get your family organized and create a command center, we have rounded up some beautiful and brilliant command center ideas. Use these family command center ideas for inspiration to create your very own family command center! We love this school command center idea by A Bowl Full of Lemons. 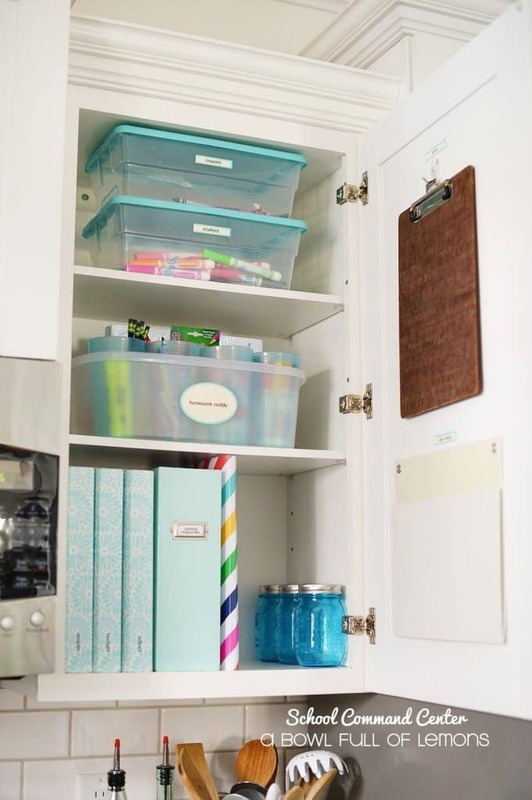 She created the perfect family command center to organize school supplies, school schedules, and because she used a kitchen cabinet there is extra room for a recipe binder, meal planner, and a school planner! Clean and Scentsible created this beautiful kitchen command center. 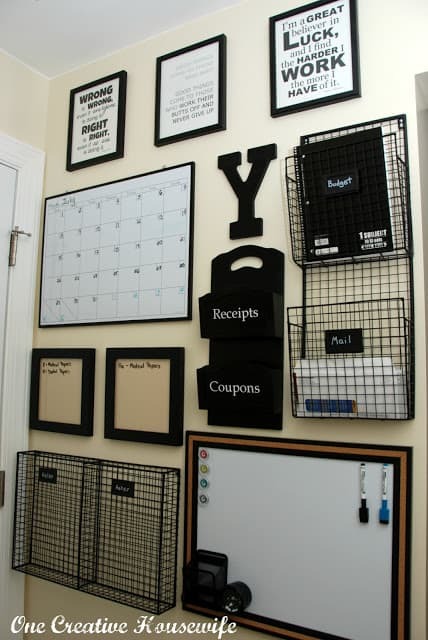 I love how she used a wall organizer to organize files and office supplies! This kitchen command center is to die for! And such a cheap and simple project done by How to Nest For Less. 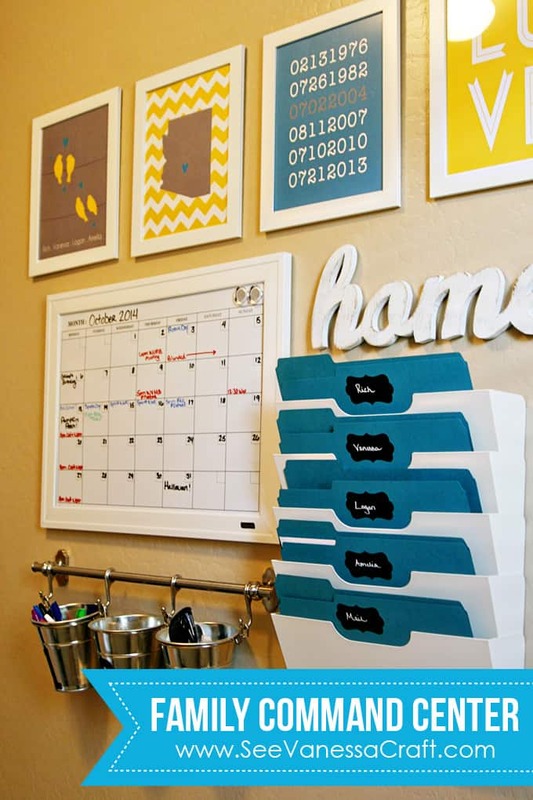 She created her own calendar and attached desk organizers to the wall! Be sure to read her brilliant tutorial! If you don’t have an extra wall to use for a command center, what about a cabinet? 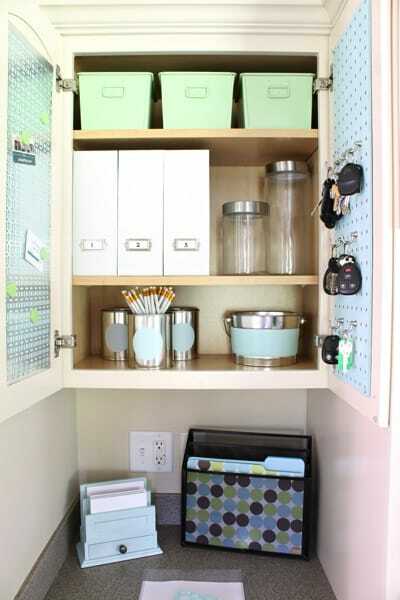 Cabinets are a great place to create a command center. 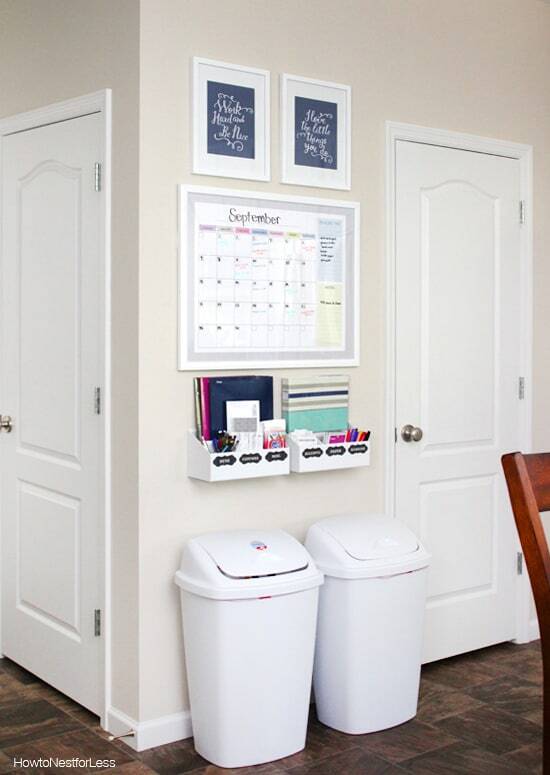 Using baskets, bins, and magazine holders you can create a great place to organize your families needs! 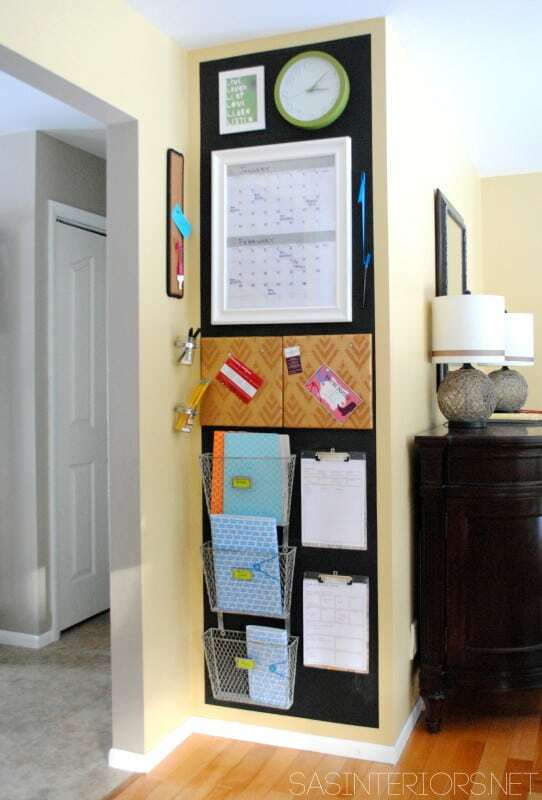 I love this entryway command center! 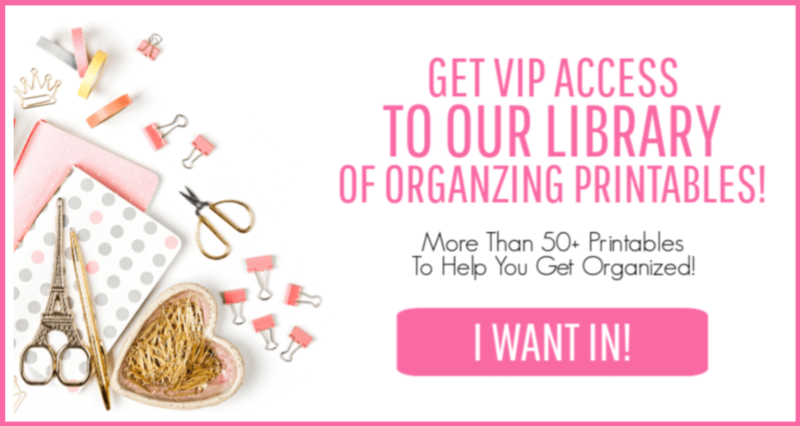 It is perfect for any family to stay organized! 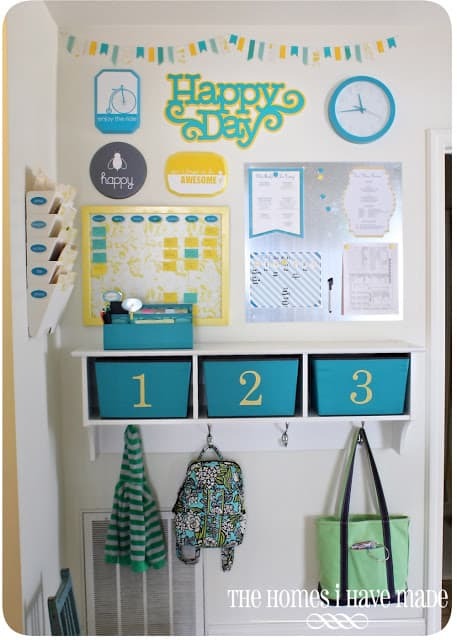 Abby from Just a Girl and Her Blog used file folder holder, a calendar, a cork board and adorable artwork to create this fun and beautiful command center! This wall command center idea is another great example of how you can create a command center anywhere! 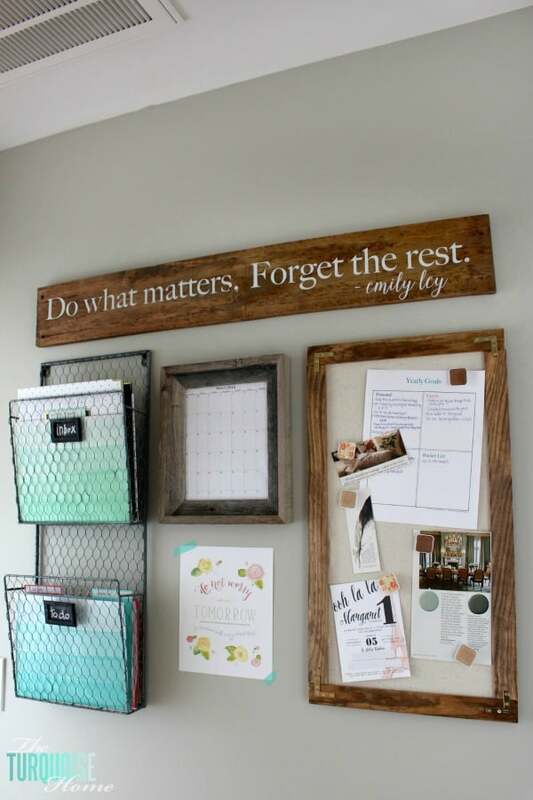 I love how Miss Frugal Fancy Pants created this beautiful wall command center! 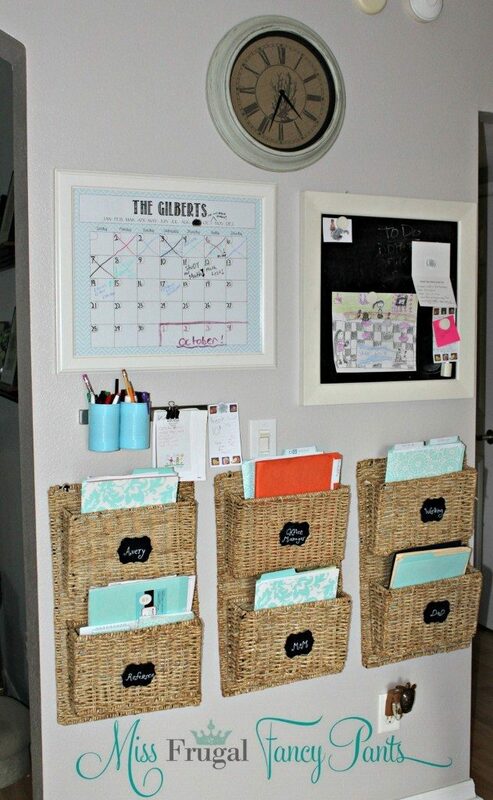 And the basket file organizers are a great way to stay organized and be decorative at the same time! You can create a command center anywhere in your home, but the kitchen is one of the best places! For most families, the kitchen in the heart of the home. So why not keep all of your families important information in the kitchen? Not Just A Housewife created this beautiful command center in her kitchen! 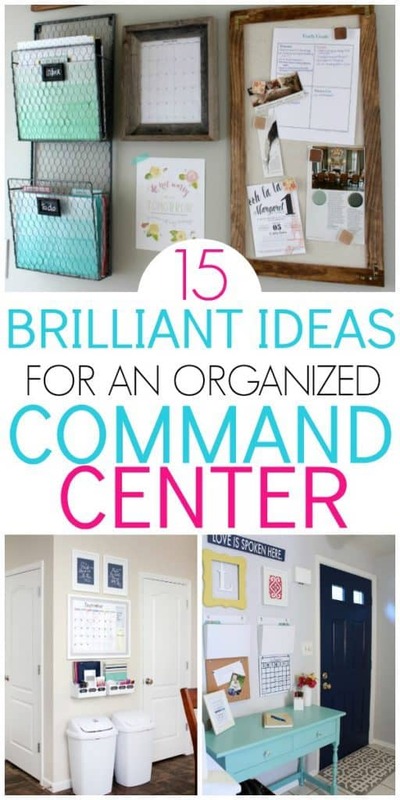 It is such a great inspiration to create your own command center! I love the black and white simplicity of this command center. Not only is it efficient but it’s stylish. 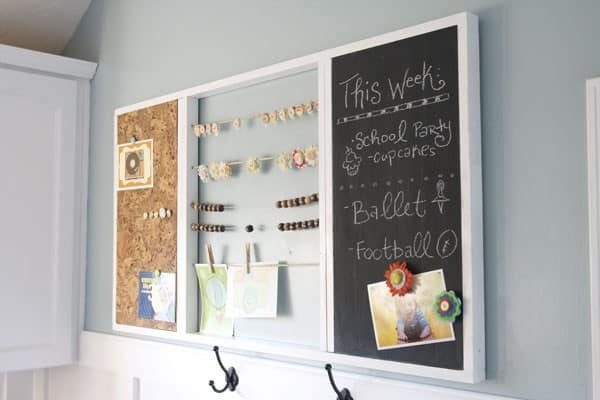 Not to mention the simplicity of it makes you want to be organized even more! This family command center by See Vanessa Craft is adorable! The extra touches with her famillies state, and birth dates really make it custom for her family! Plus the colors are adorable! Command centers can be functional as well a decorative touches in your home! This is such a unique and cute twist to the normal command center. The handmade home build this command center themselves! Check out their tutorial on exactly how to make this command center! If by some chance you have an extra closet that you are not using, why not turn it into a command center/desk? The Happy Housie created this amazing space by turning an extra closet into a workspace and command center for their family! Such a great idea! This command center from The Homes I Have Made is so fun and colorful! Making a command center a little more colorful and fun is a great way to get your family involved and encourage them to stay organized! I love how she added hooks for bags and backpacks! The farmhouse design of this command center is my absolute favorite style! Don’t you love it? The wood frames are elegant, giving this command center an organized and decorative feel! 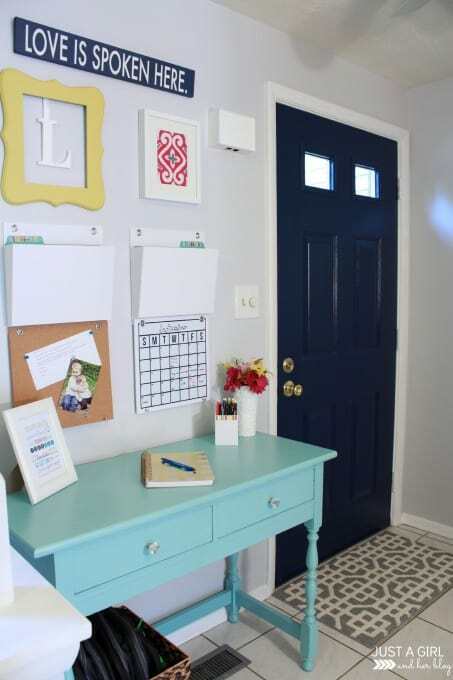 An entry way is the perfect place for a command center! This one by The Yellow Cape Cod is absolutely perefect if you have children. 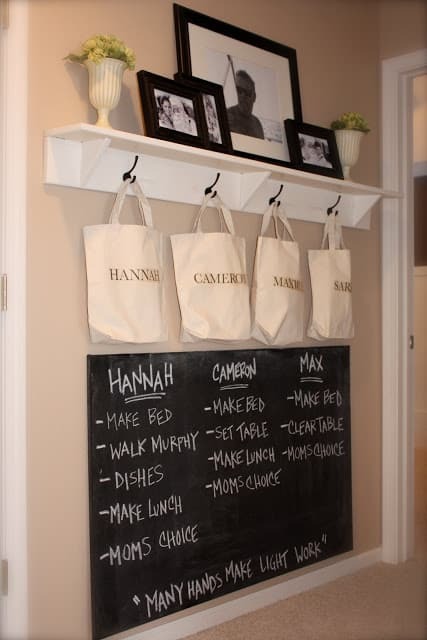 I love how she incorporates chores into the chalkboard! So are you ready to create your own command center? These designs are some of our favorite command center ideas. I hope this post gave you some inspiration! And don’t forget to sign up for our freebie library and download a free calendar to use in your command center!